Each year on March 8, hundreds of International Women's Day events occur all around the world. The events range from small informal gatherings to large-scale tributes. Laurier is taking part with events throughout the week to engage students in Waterloo and Brantford. The Brantford campus' Collective for Feminist Action and Research (CFAR), in collaboration with the Brantford Women’s Faculty Colleague, will hold events from March 9 to 12. Follow CFAR on Twitter: @CFARBrantford. The Laurier Centre for Women in Science is holding a special free screening of the award-winning documentary Particle Fever on Sunday, March 8 at 2:30 p.m. The film is about the hunt for the Higgs boson – the biggest experiment ever built. There will be a panel of scientists and experts after the screening discussing science, gender and film. This event is open to the public. Tickets are available at eventbrite.com. Learning about the actual experiences of women scientists is an important part of encouraging women and girls in science. To learn about what it is like to be a woman in physics today in countries across the world, visit MySTEMstory.wlu.ca. 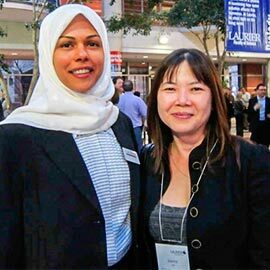 This website, which contains over 30 stories about women in science, was created when Laurier hosted the fifth annual International Union of Pure and Applied Physics International Conference on Women in Physics, and the site continues to grow. Allison McDonald, assistant professor of biology, provides down-to-earth, experience-based advice to women in science. Her blog features tips on blending family with academic career success, tips for graduate school as well as thoughts on science role models. You can also follow her on Twitter: @AEMcDonaldWLU.